It has been two years since the local real estate market topped out in late 2005. Since then home prices have been in a steady state of decline, with no indication on when we will hit bottom. So far this month, home sales are almost 12% behind where they were in 2006. Builders are finally beginning to pull back the reigns on new construction. I spoke with one local builders agent and she commented that while the builder has plenty of available land to construct new homes on, they are slowing development until the market figures itself out. Thank God. One of the reasons for the supersaturated numbers of homes for sale is because builders have kept building homes at a record pace. Now with their slowdown, the market can breath a little better and hopefully start to recover. Minneapolis recently was ranked #2 for Top Home Buyer’s Markets in the nation. 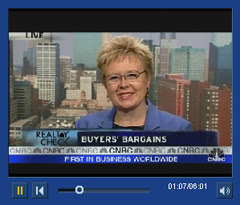 Our Minneapolis Area Association of Realtors president, Deb Greene, was a guest on CNBC this week and had the opportunity to discuss the Minneapolis real estate market. Click on the video to hear what she has to say.